Next-generation consoles have wowed gamers with breathtaking graphics, surround sound and stunning gameplay since coming on to the market in the past year. Cutting-edge video games might be a dream come true for consumers around the world, but for many companies developing them, it's been a nightmare. The movie-like productions on Sony's Playstation 3 and Microsoft's Xbox 360 games have meant that the cost of producing them has risen sharply. 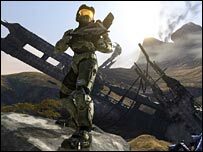 Halo 3, an extremely popular game produced by Microsoft, is estimated to have cost $30m (£15m). However, the American software giant was able to recoup that, and the millions more spent on marketing, straight away. On its first day of sales, it brought in $170m, setting the record for the most money earned in a day by an entertainment product. It far outstripped the money made in a day by Spiderman 3, the biggest-grossing Hollywood film. 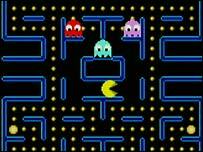 Back in 1982, the Japanese company Namco produced Pacman for $100,000. 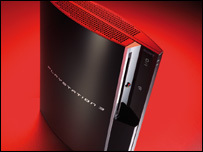 Now, the average Playstation 3 title is estimated to cost $15m. Even after adjusting for inflation, that is still a significant rise. While production costs have tripled in recent years with the introduction of next-gen consoles, sales and revenue have hardly changed. This means that for many of the smaller games companies, staying profitable is a serious issue. One such company is Blitz Games, based in Leamington Spa in the UK. Its founder and chief executive, Philip Oliver, says it's a battle to control spiralling costs. "These costs have risen so sharply because of the complexity of the devices which we are writing the games for," Mr Oliver says. "The costs have risen most sharply on the graphics side. We have entered a new era of high-definition video gaming. "This has led to team sizes having to increase in this area, for new tools to be created for this and generally the costs are rocketing. This is actually having a severe hit on the industry." Company bosses such as Mr Oliver have needed to find novel ways of funding games development. Increasingly, this means outsourcing some of the work abroad. This is the biggest source for concern for the industry body, the European Games Developer Federation (EGDF). With profit margins so tight, the line between survival and failure can rest on the sales from just one Christmas. The fear is that many companies will simply not survive the festive period. "It is not unlikely that after Christmas, we may find there are some casualties," says EGDF chairman Fred Hasson. "Companies would have banked on a lot of their expenditure coming good during the Christmas period, when a good quarter or more of games are sold in the UK and in Europe. "Lack of success could mean downward share prices and some companies getting into difficulty." Not everyone is sympathetic to the woes of the smaller players in the games industry. Professor Danny Quah, head of economics at the London School of Economics, is one of them. He believes that we are now living in a digital economy, where almost all of the costs in starting up a new succesful product are in research and development. "The key feature in all of these digital goods is that they are expensive to create in the first instance, hence the heavy research and development outlay," Professor Quah says. "But subsequently they are practically costless to reproduce in billions and billions of copies." This gives the major players like Microsoft and Sony an advantage. 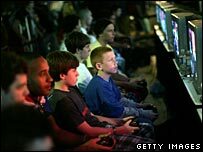 They can afford to invest huge sums in research and development of new computer games, to make the most of the even bigger profits. He says that this new digital economy is one of high risk and high reward. "Because of these very high upfront fixed costs, the risks that these entrepreneurs have to undertake are likely expanded from before," he says. "That's not necessarily a bad thing, though. The fact is that with risk comes reward and the two go hand in hand. "What we see is that the economy becomes much more in-your-face, much livelier, much more real for the people who are engaged with it." Many companies are counting on the sales to expand quickly in the coming years as these next-generation consoles become widely established in households. "There's long-term rewards in this," says independent games consultant Nick Parker. "These products will last five or six or seven years and will increase the number of consoles out there, driving software sales. "Obviously at the moment, it's high-risk, because there aren't so many consoles being sold. In the long term, there's the opportunity to get the money back. That's why we are in the business." So, there might be money to be made at the end of it all, but for many companies now, that seems a long way away. Has 2007 been one of the best ever years for video games?